Whitsundays Sailing Adventures have a catamaran for all types of adventure seekers, Wings Sailing Adventures offers up to seven locations over two days and two nights for the 'Flash Packer' who wants to enjoy all the extras or you can sail in style with one of their love cats 'Whitsunday Getaways' for those that are chasing a bit more luxury with four private cabins on each vessel all with their own private en suites. 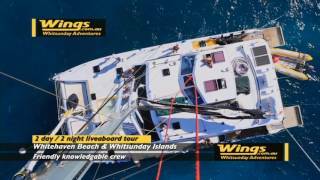 Whitsunday Getaways provides an intimate sailing adventure in comfort and style. 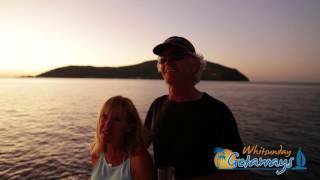 Jump on board either of their beautiful catamarans and explore the amazing Whitsunday Islands. They offer two-night cruises for couples, departing six days a week. Both boats comfortably accommodate four couples in private, air-conditioned cabins with en suites. Your professional Skipper and Host will ensure your wants and needs are taken care of as you sail, snorkel and explore this spectacular playground. The Whitsundays by sail for the discerning traveller that wants style and comfort. Cruising for couples with private double cabins. Amazing fresh food, all meals prepared on-board by your host. Great sailing with hands on opportunities under the guidance of our experienced skippers. Full service experience provided by highly professional crew. Use of their stand-up paddle boards . Relaxed and intimate trip for couples and honeymooners (private charters on request). Wings crew are passionate about marine life and showing guests the underwater world of the Great Barrier Reef. If the weather permits, they will wake up on the first morning at Whitehaven Beach and then bushwalk to the lookout overlooking the swirling sands of Hill Inlet. 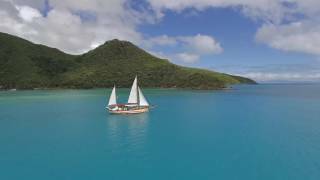 Their fast, modern, air-conditioned sailing catamarans will take you to all the best snorkel locations the Whitsunday Islands have to offer. Lots of deck sunbaking space. Underwater blue lights for night time viewing of marine life.